Happy Sunday, my lovely chickens! How's it going? It's exciting times here in the Ellison house. 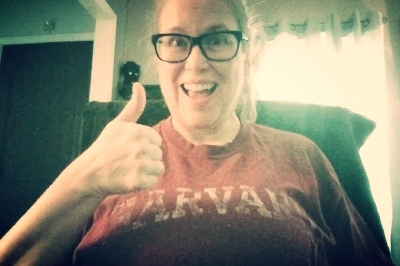 This week I had the pleasure of wearing my old, battered, torn, Harvard T-shirt— the T-shirt I wear for a particular special occasion. What's that, you ask? I FINISHED A NEW BOOK!!! ✨🎉🙌😎 My 19th novel. I can hardly believe it. This is the 19th time I've hauled that shirt out of the chest, and it worked again. I admit, it's tradition. This shirt is my lucky charm, seriously. If I'm not wearing it, I simply can't finish! There was much rejoicing and tears and queso post-finish. But. The very next day, I was back at it, editing my 18th novel, LIE TO ME, coming to your hot little hands September 5. No rest for the weary, folks. Even when you have the best job in the world. Okay, y'all, here's one of the most important things you'll read: fix the internet by writing good stuff and being nice to people. This is a wonderful, thought-provoking clarion call to get away from posts with only 140 characters, hostile trolls, and video ads that play unprovoked (WHY??) and back the days of thoughtful discourse, long blogs, and creative/independently-owned content. This is what I looked for when I hired #TheKerr: someone who knew different things from me. Together, we have a wider breadth of knowledge and skill set. Win. I swear to you, if you saw Jack Kerouac's house in St. Petersburg, FL, you would never believe he lived there (or maybe you would). In any case, it's up for sale—but fans are trying to turn it into a museum. Gardeners, I need your help! I'm doing something different in the gardening realm this year and would relish your expertise in the comments. We debuted a new episode of A WORD ON WORDS this week! I talked to local author Robert Hicks about his poignant historical novel, THE ORPHAN MOTHER. Did you get the April newsletter this month? No? Sign up here, and get all whole inside scoop: fun news, exclusive contests (newsletter chickens got their own LIE TO ME ARC giveaway this month...), yummy recipes, and all kinds of tomfoolery. You even get a free ebook as a thank-you gift! That's it from me! Y'all have a nice week, open the windows, put some flowers in a vase, and we'll talk again soon.